EVERY WIFE HER OWN COOK;MAIDS, AVANT! 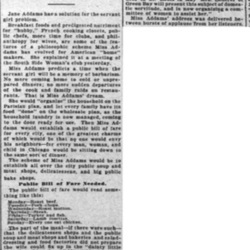 Jane Addams Outlines Utopian Scheme of Home Life -- Solves Servant Problem. Jane Addams has a solution for the servant girl problem. Breakfast foods and predigested nutriment for "hubby," French cooking closets, public chefs, more time for clubs, and philanthropy for wives, are some of the features of a philosophic scheme Miss Addams has evolved for American "home" makers. She explained it at a meeting of the South Side Woman's club yesterday. Miss Addams predicts a time when the servant girl will be a memory of barbarism. No more coming home to cold or unprepared dinners; no more sudden departures of the cook and family raids on restaurants. That is Miss Addams' dream. She would "organize" the household on the Parisian plan, and let every family have its food "done" on the wholesale plan, as the household laundry is now managed, coming to the door ready for use. Then Miss Addams would establish a public bill of fare for every city, one of the greatest charms of which would be that no one would envy his neighbors -- for every man, woman, and child in Chicago would be sitting down to the same sort of dinner. The scheme of Miss Addams would be to establish all over the city public soup and meat shops, delicatessens, and big public bake shops. Public Bill of Fare Needed. Friday -- Turkey and fish. Sunday -- Every one eat chicken. The part of the meal -- if there were such -- that the delicatessen shops and the public soup and meat shops and bakeries and salad dressing and food factories did not prepare the wife could fix up in the "dainty little French cooking closet," Miss Addams says. "The only thing would be that some of the women might not want mutton on Wednesday," said Miss Addams. "But a reform of this sort is needed, and we must look to the women's clubs to see it inaugurated. The scheme failed among a large number of club women who tried it on a small scale in Des Moines, but it was only because they did not take it seriously, and got so they would not warm over for breakfast and luncheon what was left from dinner, so as to get ready for the new meat from the shop at dinner time. Breakfast Foods in First Step. "We take the breakfast foods as a matter of course, then why not the cooking shops? The breakfast foods show that we have taken one more step toward settling the food question. The cooking is a drudgery and ought to be done outside. "It is not the kitchen work that the domestics object to," continued the founder of Hull house. "It is the name servant." Girls seem willing to work in the stock yards making soups and in the bakeries and delicatessens to prepare different foods for us, but they do not like to work in the kitchen. Our servants grow fewer each year. Something must be done. But the changes toward the realization of this ideal system of public shops will have to be done gradually, as we club women see an opportunity to do it. "It is with pleasure that I tell you sisters," went on Miss Addams, "that at the National Federation of Women's Clubs to be held in St. Louis in May Mrs. Lederer of Green Bay will present this subject of domestic servitude, and is now organizing a committee of women to assist her." Miss Addams' address was delivered between bursts of applause from her listeners. "Every Wife Her Own Cook; Maids, Avant!," InterOcean, February 17, 1904, p. 5. "No Servants; Every Wife Her Own Cook," Indianapolis News, February 17, 1904, p. 7. This report was published in several newspapers. 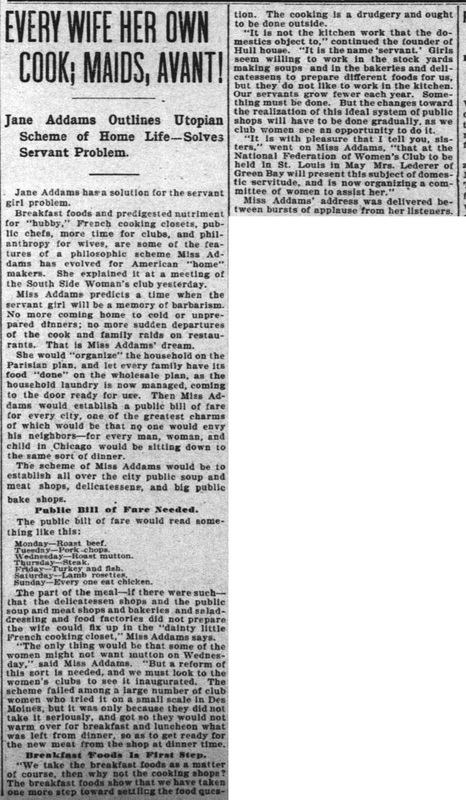 Addams, Jane, “Address to the South Side Woman's Club, February 16, 1904 (excerpt),” Jane Addams Digital Edition, accessed April 23, 2019, https://digital.janeaddams.ramapo.edu/items/show/6054.